She died in a mountain climbing accident. How Tragic. RIP. Karine Ruby, a former Olympic snowboarding champion who had been training to become a mountain guide, died Friday in a climbing accident on Mont Blanc. She was 31. Ruby was roped to other climbers when she and some members of the group fell into a deep crack in the glacier on the way down the mountain, Chamonix police official Laurent Sayssac said. A 38-year-old man from the Paris region also died in the fall, and a 27-year-old man was evacuated by helicopter with serious injuries and hospitalized, Sayssac added. 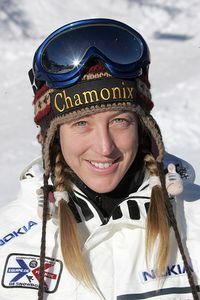 Ruby won a gold medal in the giant slalom at the 1998 Nagano Olympics and a silver in the parallel giant slalom at the 2002 Salt Lake City Games. She was a six-time world champion with 65 snowboard World Cup victories. She retired after the 2006 Turin Olympics, where she was eliminated in the quarterfinals of the snowboardcross event.